Our ultimate guide to expedition cruising. Cruising on the Zambezi Queen. a Virtuoso travel advisor based in Richmond, Virginia. Smaller ships with shallow drafts can slip into off-the-beaten-path ports at little-visited locales, providing an intimate portrait of remote landscapes, wildlife, and cultures. Travelers can test their comfort zones on life-list adventures without sacrificing modern comforts such as spa treatments and gourmet cuisine. Low passenger counts beget onboard camaraderie, and flexible itineraries allow lingering, say, over polar-bear sightings. Here are 26 of the best reasons to get on board, from Alaska to Zodiac. Alaska - The Great Land is a gold mine for expedition travelers. 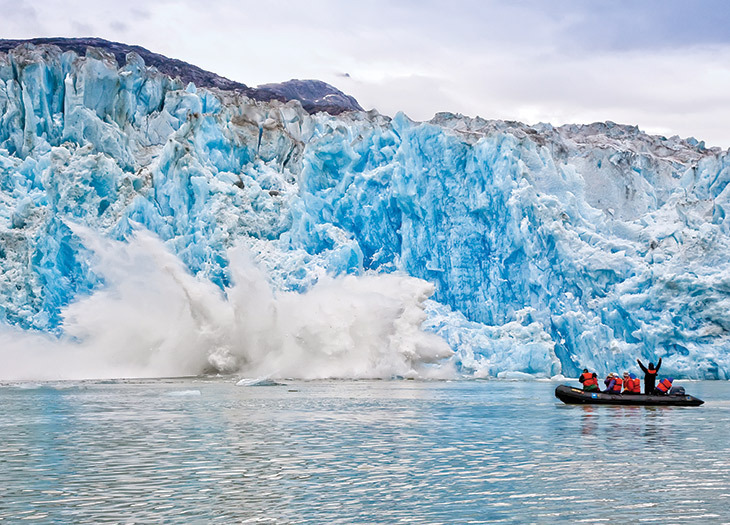 Smaller vessels can navigate its narrow channels and hidden harbors that megaships can’t reach, while Zodiacs and kayaks allow for up-close encounters with wildlife and calving glaciers. Binoculars - Waterproof, wide-angle binocs keep birds and breaching whales in view. One of our favorites: Steiner’s Marine 7x50 with its signature Sports-Auto Focus system that takes the fuss out of focusing while on rough waters. steiner-optics.com. Conservation - Many expedition cruise providers look to lessen their footprint on the natural environments they visit. A number also team up with sustainably minded nonprofits. For example: Un-Cruise Adventures partners with Seafood Watch and serves only seafood caught or farmed through ocean-friendly methods. than it answers. How did a once-thriving culture develop here – and then perish? Why did its people carve giant stone moai out of volcanic rock? What was the strange Birdman cult all about? Cruise: Behold moai and tour a Birdman ritual site during Ponant’s 14-day Pacific voyage aboard the 264-passenger Le Soléal. Fiftieth Anniversary - This year marks the golden milestone of the first nonscientific expedition to Antarctica – led by Lars-Eric Lindblad. The trip launched his namesake adventure company, as well as the very concept of conservation travel. Cruise: Mark a half century of Lindblad Expeditions on a 14-day exploration of the White Continent while sailing the 148-passenger National Geographic Explorer or 102-passenger Orion. Galápagos and Its Giant Tortoises - The largest tortoises in the world have become an icon of this wildlife mecca, which gets its name from the old Spanish word galápago, meaning “tortoise.” The shelled reptiles can weigh up to 900 pounds and live for more than 100 years in the wild. Hawaiian Islands Humpback Whale National Marine Sanctuary – Encompassing 1,400 square miles in the waters off Maui, Kauai, Oahu, and the Big Island, this federally protected sanctuary is one of the most important marine breeding grounds on earth. During annual monitoring in March, volunteers reported a humpback sighting, on average, every 15 minutes. Cruise: Un-Cruise Adventures’ 36-passenger Safari Explorer hops around four Hawaiian islands over eight days. on earth. Popular jungles for expedition cruises include the Amazon, the Mekong, and, increasingly, Panama’s Darién Gap. Kimberley, Australia - Covering more than 160,000 square miles in Western Australia’s northern region, the untamed Kimberley enchants with otherworldly red ranges and beehive-shaped sandstone towers, thundering falls and serene billabongs, not to mention Aboriginal rock art upwards of 25,000 years old. Low Passenger Counts - With fewer passengers, smaller vessels tend to foster community among guests and crew. Mekong River - With biodiversity second only to the Amazon’s – including 1,300 known species of fish – the Mekong River winds some 3,050 miles across Southeast Asia. Along the banks of this “River of the Nine Dragons,” travelers find ruins from the ancient kingdoms of Siam and Khmer, remote Buddhist stupas and temples, remnants of colonial empires, and a way of life largely untouched by time. the sun that interact with the earth’s magnetic field. Sightings are frequent during Arctic Circle sailings. Cruise: Look for the aurora on an eight-day Greenland voyage with Quark Expeditions, which sends the 78-passenger Ocean Nova to navigate the world’s largest fjord system. Observation Decks and Lounges - With their top-of-ship position and wraparound panoramic windows, these decks and lounges provide an excellent vantage point from which to watch wildlife and constantly shifting scenery. 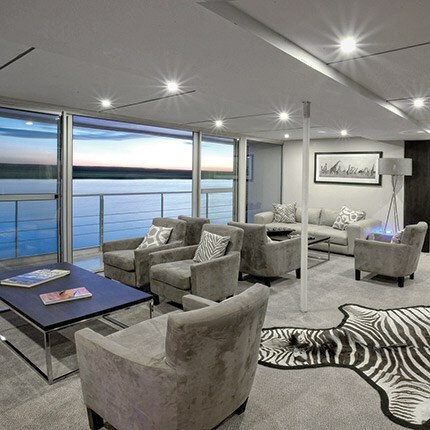 Aqua Expeditions’ outdoor lounge aboard the 40-passenger Aqua Mekong, for example, provides intimate perspectives of the Mekong, while the deck atop the 28-passenger Zambezi Queen – featured on AmaWaterways’ African voyages – allows guests to watch big game along Botswana’s Chobe River. Pink Amazon River Dolphins - The endangered boto – the world’s largest freshwater dolphin – ranges in hue from pinkish gray to hot pink to nearly white at maturity. Cruise: After overnighting in Lima, see these playful creatures and explore Peru’s protected Pacaya-Samiria National Reserve on International Expeditions’ eight-day Amazon River cruise aboard the 31-passenger Estrella Amazonica. Quick-Drying Clothing - Packing the right gear, such as water-resistant pants from prAna (prana.com), is essential on expedition. Remotely Operated Vehicles - The ROV aboard Crystal Cruises’ expedition megayacht Crystal Endeavor (debuting in 2018), for instance, allows guests to see sunken galleons and other undersea attractions at depths up to 12,500 feet. Silver Cloud Expedition - Silversea Expeditions is currently completing an extensive refurbishment to Silver Cloud (sailings begin November 2017) that will make it the most luxurious ice-class expedition vessel– think extensive dining options and suites with verandas to behold breaching whales. Thermally Heated Pools - Nature’s hot tubs are as integral to Icelandic life as pubs are to the Irish, and a daily dip is common. The milky-white silt that sits atop the country’s famous Blue Lagoon is a natural exfoliant and wrinkle reducer. Cruise: Get some geothermal therapy on Tauck’s eight-day adventure around Iceland’s west coast aboard the 264-passenger Le Soléal. Underwater Cameras - Snorkeling and diving excursions provide opportunities to capture stunning images below the water’s surface. To this end, check out the Olympus TG-4 Tough, which lives up to its name with a depth rating of 50 feet. Take it even deeper with special underwater housing. Vanuatu - One spot where an underwater camera will come in handy: the Oceanian island of Vanuatu, where, just offshore, lie the remains of the President Coolidge ocean liner – ranked as one of the top wreck dives in the world. Cruise: Zegrahm Expeditions visits Vanuatu while exploring Melanesia’s vast diversity on a 17-day cruise aboard the 100-passenger Caledonian Sky. Walruses - Found around the Arctic Circle, these mustached mammals grow tusks that they use to break breathing holes in the ice, determine social status, and pull their blubber- covered bodies ashore from the frigid waters. Xpedition - Expedition cruising isn’t only about adventure: Celebrity Cruises’ 100-passenger Celebrity Xpedition megayacht offers spacious suite options, upscale dining, and spa treatments while sailing year-round in the Galápagos. Yakushima Island, Japan - This remote, UNESCO-designated island is forested in giant sugi (Japanese cedars), which reach heights of up to 80 feet and have an average life span of 500 years – the island’s oldest specimen is estimated to have lived for five millennia. Newly announced voyages from Zegrahm Expeditions and Abercrombie & Kent will visit the island in 2017. Zodiacs - A staple for ship excursions, these extremely sturdy, inflatable watercraft allow expedition travelers to navigate choppy seas, feel the spray of icebergs, and land on isolated beaches or rocky shorelines.